Read our in-depth guide on how to protect your precious pearl jewellery, clean stubborn stains and maintain so that it shines lustrously through the years. Pearls are a classic go-to jewellery choice for women. These iconic jewels are an essential part of every woman’s jewellery must-haves. Throughout the decades, these beautiful orbs from the sea have had their fair share of popularity and pomp, their trendiness waxing and waning as styles evolve and develop, but never disappearing completely. In fact, 2018 saw pearls coming back into fashion big time, as we predicted in our best earrings trends for 2018 article. Pearls aren’t just worn for their iridescent beauty, they have huge symbolic and cultural appeal too, which draws collectors of fine jewels to them. Due to the nature of their existence, pearls are said to stand for the wisdom that is gained from worldly experience or hardship. They’re said to attract luck, protect their wearer and have a soothing effect on oneself. Their luminescence is often associated with stand out personality traits such as integrity, loyalty and being pure and generous of heart. Pearls are steeped in legend and rich in history. Hindu mythology talks of pearls being drops of dew that fell on to the sea that was lit up by the moon. It is seen as a symbol of purity and is favoured by brides on their wedding days. The Greeks believed that pearls were the tears of gods and cultures across the world believe that the beautiful pearl represents perfection and grace. If you are the proud owner of fine pearl jewellery, you are probably aware of the many myths and legends that surround these timeless keepsakes. To maintain their lustre and sheen, proper care needs to be taken. In case you are wondering how to clean your pearl necklace, you are in the right place. Pearls can be fussy to care for and require strict maintenance in order to keep them in the best condition. 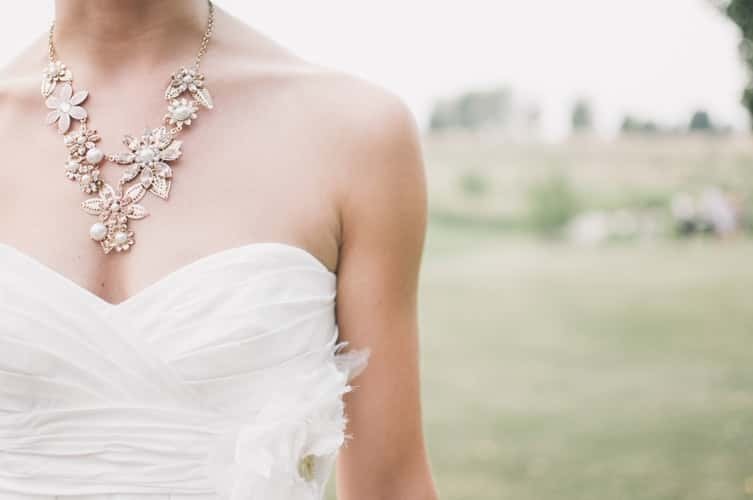 In this article, we outline the best way to care for your pearl jewellery and keep it in tip-top condition to dazzle on your next evening out. If you want to know how to clean pearls safely, the first thing you need to keep in mind is that pearls are very delicate in nature. They’re soft and fragile so they need a light hand when they’re being handled for cleaning. The nacre, the luminescent covering of the pearl, is quite soft and the durability and strength of the pearl depend on the thickness of this nacre. The thicker the nacre, the more expensive the pearls usually are. Thin nacre layers can chip easily, leaving marks and scars – this is an issue that especially crops up with cultured pearls. The method for how to clean cultured pearls at home is the same as how to clean natural pearls at home – however, cultured pearls tend to be more prone to damage. Strung pearl necklaces and bracelets need special care due to the way they are put together. The string can get weak and break if exposed to liquids for long periods or not maintained correctly. Use a gentle touch – never scrub pearls and avoid wipe your jewels with a lot of pressure as you could risk removing the nacre. Never wear pearls while bathing. Prolonged exposure to water can cause the string to weaken and affect the nacre negatively. Put your pearls on just before you leave the house. You want them to be the least exposed to your getting ready rituals. This prevents risks of tugging when wearing clothes, exposure to moisturizer and lotions, or staining from applying makeup and spraying on perfume. Clean pearls gently after every use. Use a soft cloth to lightly wipe down your jewellery. In case of tough dirt or stains, wet the cloth lightly before use. In case you have used a damp cloth to clean your pearls, leave them out to air dry for a few hours before packing them away. If you’ve been sloppy on maintenance and your jewels have developed unsightly stains or collected dirt, you will need a more intense cleaning regime. Keeping in mind you still have to be extremely gentle, the best way to clean pearls is with mild soap mixed into water to form a light solution. Some websites recommend using vinegar to wash pearls. Don’t do this. Its acidity will eat into the coating of the pearl and damage it. Take a soft cloth dipped into this liquid and use the cloth to gently rub away dirt and grim. Don’t soak your jewels in this liquid – it can damage them. After you have cleaned the jewel, use water to rinse off any soap residue, pat dry and leave the jewels open till completely aired out. You may be tempted to use strong detergents on tough stains but avoid doing this. Ammonia-based solutions are a strict no-no. 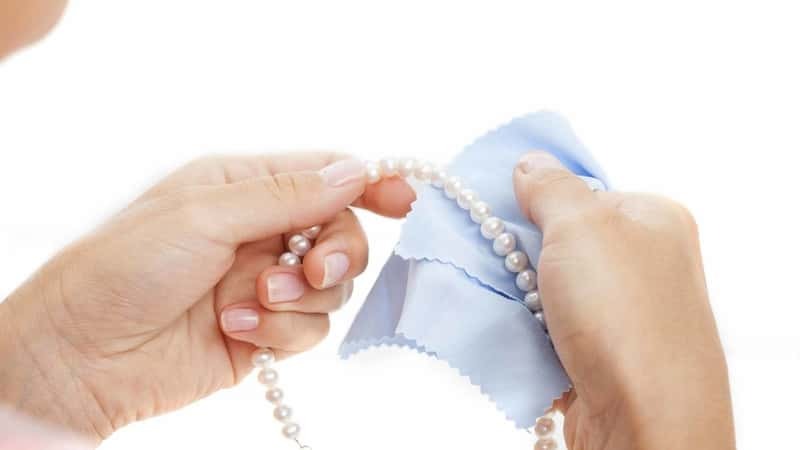 Always wipe pearls with a soft, lint-free cloth. Any abrasive material runs the risk of removing the pearl’s precious nacre. Pearls need regular cleaning but don’t make the mistake of overcleaning the jewellery. If stored properly, you only need to wipe clean your pearls lightly after each use. Overcleaning can lead to dullness and damage. To clean the jewel’s clasps, used a cotton bud or Q-tip dipped in jewellery cleaning liquid to gently wipe off any grime of tarnish, carefully avoiding any pearl part of the jewellery. If in doubt, don’t clean your pearls at home. Take them to a jeweller who will do a professional cleaning without the hassle and risk of damage. Maintaining your pearl jewellery over the years is easy if you follow a few simple rules. Prevention of damage and dirt is always better than dealing with it later. Proper storage is vital to preventing harm to your precious pearls. Here’s how to keep your jewels in tip-top condition. Keep each of your pearl jewellery pieces separate during storage. You’ll want to pack it so that each pearl does not rub against any abrasive or hard surface like gold or gemstones. Because the nacre can get scratched easily, you’ll need to wrap each jewel in soft tissue or chamois bag and store it in a separate box or compartment from your other jewels. Storing them flat is also good to avoid abrasion of the jewel against itself. Make sure that clasps are put on before you store jewellery so that open pins do not come into contact with the soft, delicate pearls. Classic pearl necklaces need to be checked regularly (about once every year) to see that the strings are intact and not breaking. In case the silk or nylon threads are wearing thin, your necklace will need to be restrung. If you are travelling with your pearl jewellery, read our expert tips on packing and storing jewellery to avoid damage and tangling. Last but not the least, don’t leave your beautiful pearls locked up in the cupboard. Pearls benefit from the moisture in the air. If you leave them unused and stored in a box for long periods of time they can dry out and lose their beautiful shine. Lack of exposure to moisture can also make their surface fragile and prone to damage such as scratches and nicks. Using your jewels often can actually help their glow and lustre. So go ahead and plan your next evening out with these iconic and feminine beauties. Read our guides on how to clean gold and how to clean silver at home for more great tips on maintaining your jewellery collection. There are many different types of pearls. Is cleaning the same?